Learning to read is the first important step in the literacy journey. Learning to *love* to read is a magical adventure! These ten books for tweens and teens are titles they can sink their teeth into, and a list you’ll enjoy reading (or re-reading), too! I developed a love of reading early on. My parents are avid readers, and I suppose that affected my inclination to pick up books. We took lots of trips to the library—a place that continues to bring waves of nostalgia each time I step foot inside—leaving with stacks of books after having returned just as many the week prior. Planning for trip has always included finding the perfect stories to pack, whether it was for our childhood vacations, summer road trips in recent years, or for my work travel. And these days even though we visit the library for regular books, I also take advantage of other mediums like audiobooks and books for my e-reader. To say reading was a huge part of my childhood and fundamental in my path to an English degree, as well as integral in building my current reading and writing habits, would be an understatement. I’m always on the hunt for new fiction books to read, and these days I really enjoy stories that pull me into a different universe with ease, both in writing style and plot. So, I’ve found that the majority of recent books I’ve loved have been slotted squarely in the Young Adult Fiction category of the library. Sure, I have a few novels I’m reading, for book club and otherwise, that are definitely for grown-ups. But many over the past decade have been written with a tween/teen audience in mind, but perfectly enjoyable for me as well. Now that my daughter’s a teenager, it’s fun to think about stories we can both enjoy and talk about afterwards—and for many, a comparison to the movie, which can be really engaging too! 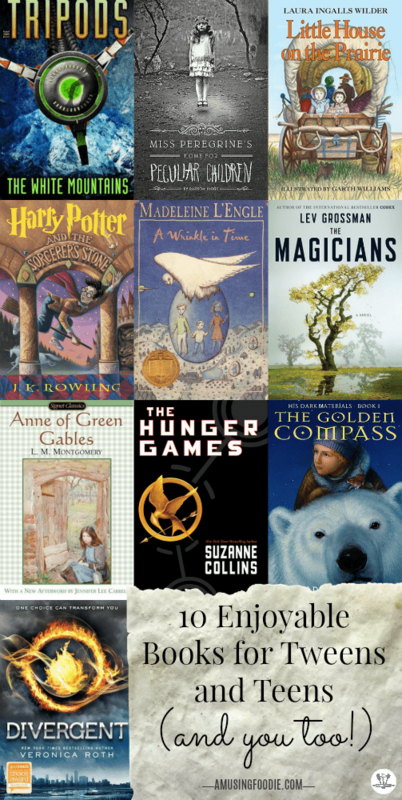 Here are some to add to your Goodreads* list! Meet Laura Ingalls … the little girl who would grow up to write the Little House books. Pa Ingalls decides to sell the little log house, and the family sets out for Indian country! They travel from Wisconsin to Kansas and there, finally, Pa builds their little house on the prairie. Sometimes farm life is difficult, even dangerous, but Laura and the family are kept busy and are happy with the promise of their new life on the prairie. Laura and her family journey west by covered wagon, only to find they are in Indian territory and must move on. The nation of Panem, formed from a post-apocalyptic North America, is a country that consists of a wealthy Capitol region surrounded by twelve poorer districts. Early in its history, a rebellion led by a thirteenth district against the Capitol resulted in its destruction and the creation of an annual televised event known as the Hunger Games. In punishment, and as a reminder of the power and grace of the Capitol, each district must yield one boy and one girl between the ages of twelve and eighteen through a lottery system to participate in the games. The “tributes” are chosen during the annual Reaping and are forced to fight to the death, leaving only one survivor to claim victory. Here lives an orphaned ward named Lyra Belacqua, whose carefree life among the scholars at Oxford’s Jordan College is shattered by the arrival of two powerful visitors. First, her fearsome uncle, Lord Asriel, appears with evidence of mystery and danger in the far North, including photographs of a mysterious celestial phenomenon called Dust and the dim outline of a city suspended in the Aurora Borealis that he suspects is part of an alternate universe. He leaves Lyra in the care of Mrs. Coulter, an enigmatic scholar and explorer who offers to give Lyra the attention her uncle has long refused her. In this multilayered narrative, however, nothing is as it seems. A thrilling and original coming-of-age novel for adults about a young man practicing magic in the real world. Quentin Coldwater is brilliant but miserable. A senior in high school, he’s still secretly preoccupied with a series of fantasy novels he read as a child, set in a magical land called Fillory. Imagine his surprise when he finds himself unexpectedly admitted to a very secret, very exclusive college of magic in upstate New York, where he receives a thorough and rigorous education in the craft of modern sorcery. In Beatrice Prior’s dystopian Chicago world, society is divided into five factions, each dedicated to the cultivation of a particular virtue—Candor (the honest), Abnegation (the selfless), Dauntless (the brave), Amity (the peaceful), and Erudite (the intelligent). On an appointed day of every year, all sixteen-year-olds must select the faction to which they will devote the rest of their lives. For Beatrice, the decision is between staying with her family and being who she really is—she can’t have both. So she makes a choice that surprises everyone, including herself. A mysterious island. An abandoned orphanage. A strange collection of curious photographs. A horrific family tragedy sets sixteen-year-old Jacob journeying to a remote island off the coast of Wales, where he discovers the crumbling ruins of Miss Peregrine’s Home for Peculiar Children. As Jacob explores its abandoned bedrooms and hallways, it becomes clear that the children were more than just peculiar. They may have been dangerous. They may have been quarantined on a deserted island for good reason. And somehow—impossible though it seems—they may still be alive. Long ago, the Tripods—huge, three-legged machines—descended upon Earth and took control. Now people unquestioningly accept the Tripods’ power. They have no control over their thoughts or their lives.